Stand up and cheer as Ohio faces its big rival, Miami. There are east side and west side events — plus one in the Akron area — so gather your buddies and come back the ‘Cats! Come watch your OHIO Bobcats roll over our archrival Miami Redhawks at a new east side location, the Mentor Harry Buffalo. The game starts at 3:30 p.m. There's an appetizer buffet for $10, and drinks are on your own. Join fellow OHIO fans in the downstairs pub at the Lakewood Harry Buffalo for the annual OU-Miami game. Kickoff is scheduled for 3:30 p.m. Enjoy food and drink specials (including some Athens favorites) as you cheer on the Bobcats. There is no cost associated; pay as you go. Join fans at Legends Sports Bar in Green (just off SR 241/Massillon Rd. in Town Park Center). Wear your green and white! Time: From 3 to 7 p.m. — Kickoff is scheduled for 3:30 p.m. Cost: East side: $10 for the appetizer buffet; drinks are on your own. West side: None - Pay as you go. Akron: None - pay as you go. RSVP: Contact Ron Smith (networking@clevelandbobcats.com) about the east side event or register here. Contact Amy Hollis (president@clevelandbobcats.com) about the west side one. For the Akron-area event, contact Nancy Roberts with the Akron Association of OU Women: bobnan14@neo.rr.com. More Info: Questions? Contact Ron Smith (networking@clevelandbobcats.com) about the east side event or Amy Hollis (president@clevelandbobcats.com) about the west side one. For more info about the Akron-area event, contact Nancy Roberts with the Akron Association of OU Women: bobnan14@neo.rr.com. 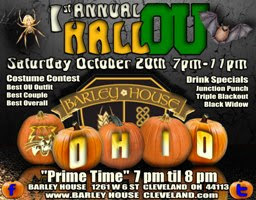 Barley House Presents its 1st Annual Hall-OU Halloween Party! What Are We Doing???? A LOT!!! We're Throwing a Party Baby! One of Grand Prizes will be a 2-night stay at OU for Homecoming 2013! Barley House has worked with The Wyndham Hotel downtown to get rooms for $89 for Saturday night! Just mention "Barley House Negotiated Rate for OU Alum"
Block of rooms is LIMITED so book your room fast to get this deal! HELP US MAKE THIS AN ANNUAL PARTY JUST LIKE ST. PAT'S IN THE FLATS PARTY EVERY MARCH! A message from Kelly Baylog with Ohio University's The Promise Lives Campaign . . .
Have you registered for the Bobcats Up Close OU Alumni Event yet? Price: $35/person, which includes private access to the museum, heavy hors d'oeuvres, two drink tickets, free parking, and much more! *Be sure to come right at 6:30 p.m. if you are interested in visiting with the live bobcats! Are you interested in being more involved in alumni activities? This reception at the natural history museum will feature a special presentation by an OU grad who works with the live bobcats in the museum's exhibit, plus a brief update from President McDavis. The title pretty much says it all, but check out the full event description on Facebook! We're looking for alumni bartenders and your favorite photos from Halloween in Athens, and we'll have a costume contest and photo contest, plus some other familiar touches of Court Street. If you'd like to help out at a game watch, propose a future event, or add an item to this month's agenda, feel free to e-mail me. Find Cleveland Bobcats on Facebook!